Expert Center: Are organic baby products really worth the money? With the arrival of a baby, the world of parents revolves around diapers, sleepless nights, rashes, bouts of crying and never ending anxiety. As a parent, you want nothing, but the best for your baby and the market is flooded with products which prescribes the benefits of green along with organic products. Such sort of products come with an added cost, and in case if you are parent on a tight budget, it is better to decide which organic products justifies the price tag. When it comes to organic products, it all revolves on whether how much I am willing to pay for an organic product? On a personal level if it is 5 % to 10 % more I am ok, but if it is 20 % to 30 %, I would really have to think about whether I need to shell out such a hefty sum. But one thing is for sure that the best organic baby products do come with a price tag. Parents are willing to make exceptions in the case of foods and are willing to shell out extra for certain type of organic baby foods. All of us are aware of the problems associated with hormones or antibiotics in our dairy or meat products, and the impact it can have on our children. It is a common aspect of what DEET along with other pesticides can also cause. As a parent, I am willing to pay that extra bit of money to get things organic. For a parent, who is using a formula, they can provide hormones or pesticides embedded in non-dairy products. When a child starts eating solids, the environmental commission recommends products which are organic and confers to the tag of a dirty dozen. A lot of research has gone into chemicals along with pesticides being used. Many companies which go on to sell organic products pass on to your kids and this includes creams, lotions, soap, toothpaste or shampoo. According to research organic shampoo tends to be more than $ 4 than the organic non-organic counterparts. But the skin of the baby is more porous than the adults. When it is put on the skin of the baby it is absorbed on to their blood stream and actually 60 % of what is being put is being absorbed. If you want to save more money you can start putting olive oil on the skin of the baby. When it comes to clothes it would not be a great idea to shell out a lot of money for organic products as 100 % cotton products may be more than enough. It cannot be given the tag of a status symbol to be honest and you need to stay clear of clothing which is made up of polyester or has dark colours, as it would mean the heavy use of dyes. In case of a mattress, the organic ones are considered to be safe as fewer chemicals are used in that regard, but they are pricey. In this regard, a cost-effective solution would be using organic sheets or pads. But ensure that these products are flame retardant and ensure that it is aired before you use it in the first place. 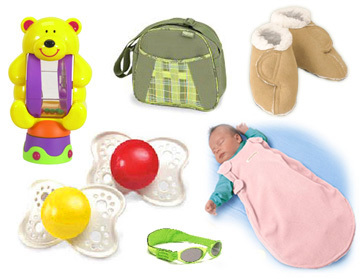 These are unique organic baby products in the market.